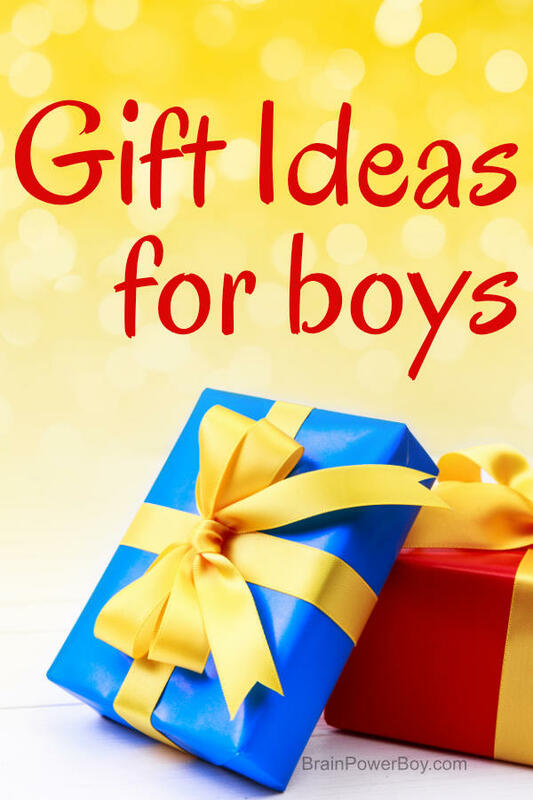 If you are looking for gift ideas for boys you have come to the right place. Ever wondered what gift to get your boys? Or been stuck and unsure how to find the perfect gift for him? I am a blogger who is also a boy mom. I know boys, and I know what they like. I am also not typical in how I do my gift idea lists. I don’t just throw up a bunch of random ideas and call it good. I put a lot of time and research into them to make sure you are getting the very best ideas that will appeal to your boys. I search through websites to see what is trending and popular, to find what is new, and what is of a very high quality. I check with the toy industry to see what they are highlighting. I look through magazines and catalogs and online toy stores. I also talk with boys to see what they actually think is awesome. That way you get the very best ideas and are sure to find the perfect gift for your boys. This post is highlighting all of our gift lists. There are lists for boys of all ages. Every gift and product post we write will be housed on this page so be sure to save it for future reference. I hope the posts below will be useful to you as you shop. If you need additional suggestions, feel free to contact me. I am happy to help. My big gift giving advice is to give things that will last a long time. I tend to have a focus on open-ended toys or gifts that follow their interest, because those get a lot of play time, and boys can learn so much from them. Plus, you get a lot of value for your dollar. Gifts like LEGO can last a child into adulthood! If you have a boy who loves LEGO, as many do, you really need to check out these gift lists. They have the very best ideas in them and I just know they are going to love them. The Very Best LEGO Stocking Stuffers Ever! LEGO Christmas Sets – Get Them Before They Are Gone! Star Wars! When I first started looking I had no idea there were so many cool things out there. Sure, I knew there were toys, but I found a whole lot more. Pick the age range and go have a look. You know they like their tech! Well, I found both tech and STEM ideas that they will really go for. And, they will be learning as well as having fun which is awesome, right?! Amazing Inexpensive Gifts for Teen Boys: Unplugged. One thing about Brain Power Boy is we like to find things that have a learning twist to them but are also really engaging and enjoyable. All of these fit the bill. The Best Sight Word Games to Make Reading Easy. Yes, boys play with dolls. They also play with dollhouses! These toys are great for boys and they truly enjoy them. I wrote a really detailed buying guide on how to choose the best dollhouse for your boy. It is the first link below which also includes a wonderful selection of wooden houses. The second link includes more unique selection such as space stations, castles and fire stations. Wooden toys are some of our most treasured toys. What I love about them, beyond the natural wood, is that they can be passed down for generations to come. See the dollhouses above for more wooden choices. Have you seen these? They are fabric, felt or nylon houses that slip over a card table. I chose the best boy topics I could find! I love how easy it is to set them up and take them down, They are also portable and can be taken to grandma’s house. Card Table Playhouse Patterns Perfect for Boys! Sometimes, instead of just giving a gift or a toy, giving an experience is really appreciated. What I did in this guide is to pair toys with some experiences ideas and I included free printable gift certificates so you could fill that out and give it with the gift. For example, if they really like animals you could give them a trip to the zoo or a wildlife sanctuary and select one of the animal gifts we suggest and pair them together. There are choices for LEGO, animals, dinosaurs, cars, trains, trucks and pirates and the gifts are for boys young and old. If high school graduation is coming up and you need a great gift to give, try this list. We are working on getting gift ideas together for every holiday. Here are the ones we have so far. Remember that the other gift ideas above are great for holiday gift giving as well. These are just specific to the holiday. Super ideas for basket fillers that boys will enjoy. Easter Basket Gift Ideas for Boys. 60+ Incredible Easter Gifts for Teen Boys You Can’t Miss! Show our guys a bit of love with these fun ideas. Wow! I had such a good time filling this post with fun summer water ideas. There are toys, water tables, rockets, sprinklers, squirters, blasters, slides and a whole lot more to keep kids cool in the summer heat. Shopping for boys can be a lot of fun. It is especially nice to have a list of items that is well-researched, that you know other boys enjoy, and that you can rely on to get great ideas. I hope you enjoy this article and make good use of it. We are happy to bring you great gift ideas for boys of all ages that are full of learning & fun and will continue to add to this list over the years. Know another mom, grandma, dad, grandpa, aunt, uncle, neighbor, friend (you get the point 🙂 ) who might enjoy this? You can use the sharing buttons below to share this list with others. Thanks! The Gift of Time because not all gifts are material in nature, and the very best gift we can give is the gift of our time and attention.